Chicago Shakespeare Company's staging of Sondheim musical Sunday in the Park with George isn't pointless, it's pointillist. Though Sondheim’s Sunday in the Park with George appears at first glance to be about a painting, it is, in truth, an opus about the different elements that constitute a community. The question about whether people who happen to find themselves in the same place (or the same painting) make a community reverberates throughout the Chicago Shakespeare Theater’s new production of the musical, especially in “It’s Hot Up Here,” a piece sung by characters who are themselves conscious of their existence within a physical and conceptual tableau ensemble. 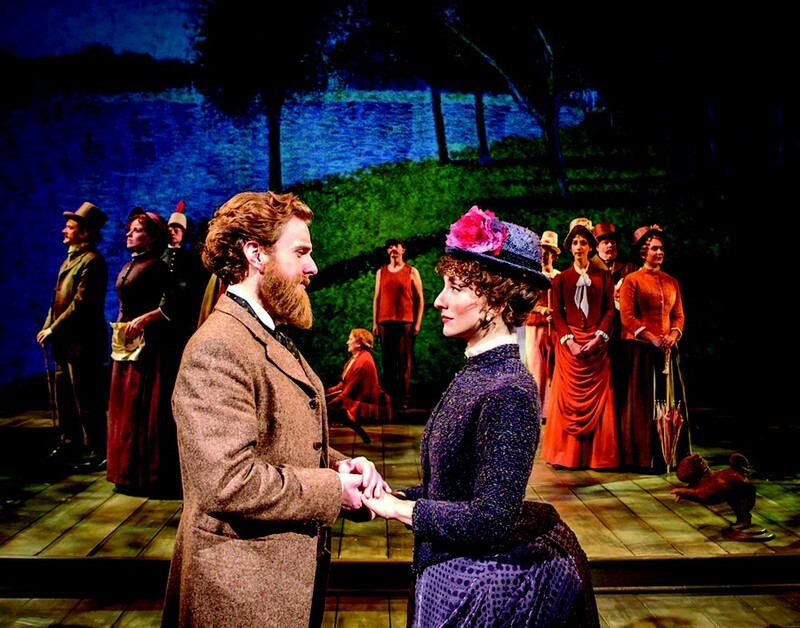 The show opens with post-Impressionist giant George Seurat (Jason Danieley) sketching his mistress, Dot (Carmen Cusack), in a park one early Sunday morning. Most of the first act consists of iterations on this theme of outlining and filling in. Various characters, who may or may not be connected to the central pair, float in and out of the scene, each with his or her own drama and place in the painting. Seurat is obsessive about his work, spending more time looking at his canvas than at the world around him. Many University of Chicago students might find themselves strongly identifying with his character (I know I did), as his dedication to his work erodes his personal life and wears on those who love him. Or perhaps Dot will pull at your heartstrings, as she ultimately discovers that Seurat’s art will forever be more important to him than she is. The pain of being an artist and of being someone who loves an artist transcends time and place in both acts of the show. Sunday in the Park with George pairs a near-perfect first act with a much less appealing second act, which has not aged very well since its first showing in 1983. Still, the music and lyrics throughout the show are of Sondheim’s typically high caliber, and fans who are more familiar with his other works (Sweeney Todd, Into the Woods, A Little Night Music, etc.) will not be disappointed. The songs themselves incarnate a form of pointillism—Seurat’s famed painting technique in which the figures and mood of the work emerge from the application of tiny dots of paint—as they juxtapose different words and sounds that the ear must piece together in order to form the complete picture. In the same way, the viewer must stand back and take in the red and blue dots in Seurat’s most famous artistic achievement “A Sunday Afternoon on the Island of La Grande Jatte” in order to perceive purple. Cusack references Bernadette Peters (who originated the role of Dot) in her portrayal, though she steers clear of mimicry with her own brand of panache. Danieley has such a grand baritone that audience members will find themselves pining for him to sing more soaring notes than the often-understated score allows. What’s more, his transformation from George Seurat to the George of 1984 is very convincing—a switch that might trip up other actors. The real stars of the production, though, are the magical costumes and sets. In fact, at the beginning of the show one of the costumes literally comes to life (I will exclude details to preserve the surprise for future audience members). Giant frames seamlessly descend from the ceiling in order to create a sort of fifth wall between the art, the actors, and the audience members. There are many other interesting innovations with various props that demonstrate their own materiality and lead the audience to feel as though they are part of an inside joke with the artistic director, Barbara Gaines. The orchestra sits above the set, with just the tips of the violin bows visible to the audience. Not everyone in the audience might notice, but the conductor is projected on a small television screen across from the stage so that the actors too can follow his lead. Ultimately, Sunday in the Park with George dabbles in the fun of a live art tableau, but shines when expressing the stories of the connections between the different characters and explaining where they fit into the work. This comment on community, as a place where one finds oneself as opposed to a place where one chooses to be, echoes in the score of the work, ingeniously connecting form and function.